So you think you want to get into the South Asian wedding Market. This webinar will answer your questions before you hop on the elephant! These weddings are complex, regal and colorful, packed with tradition. How can you help them make their dream wedding come true while still pleasing parents? 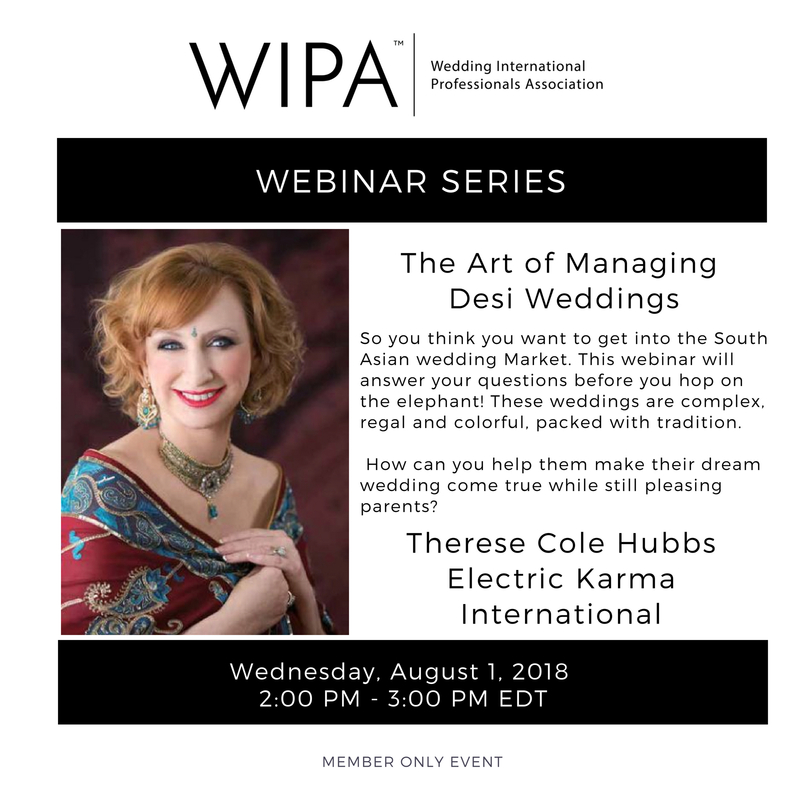 Named as the country’s leading authority on South Asian Weddings, owner and creative director, Therese Cole Hubbs and her company Electric Karma International, specializes in Indian, Pakistani and multi-cultural fusion weddings. Under the direction of Therese, the Electric Karma team of experienced professionals has produced more than 700 traditional weddings over the past 30 years. With associate offices across the country, their team brings innovative, creative and impressive ideas to each of their clients. In addition to running her world-renowned event business, Therese is an active philanthropist, designer, educator, public speaker and named Event Planner of the Year by her Houston NACE Chapter and TSE Wedding of the Year. She is a member of multiple industry organizations including WIPA (Wedding International Professional Association) and NACE. She also serves as an active member of the Indo-American Chamber of Commerce and India House Houston, a non-profit designed to promote Indian culture and values. Therese is a highly acclaimed professional speaker, sharing with audiences her vast experience in business, creative design, the art of catering, marketing strategies and wedding production. She believes that every event should be a reflection of the client’s personality and should always be an Electric Karma Experience! Emily Sullivan, owner of Emily Sullivan Events was featured on the podcast Planner in Training talking about how to successfully manage your team. She was also featured on Brides and wrote a feature article for Catersource on Late Night Menus. AllSeated was featured on SmarterCX as one of the five tech tools that are changing the wedding experience. They were also featured on Martha Stewart Weddings as one of the tools that will keep you sane while wedding planning. Xiamen Umiss launches their business as paper items producers. They create cute custom products for party events such as Birthdays, Christmas, Halloween, Summer parties, Baby Showers, New years, Bachelorette & Bridal parties, Easter, Valentines, and more! They specialize in paper pom poms, tassels garlands, banners, confetti and other party products. Luxury Entertainment Group was featured as the entertainment sponsor again for The David Tutera Symposium, where President Scott Cummings was a featured speaker on a panel of experts. They were honored again to receive the California Wedding Day Best of 2018 award for Live Music in Orange County. The company is also proud to announce new teams member Britt Kingman, who has been doing a fantastic job in her new role as concierge, and Kelcee Namoca, executive assistant to Scott Cummings. Luxury Entertainment Group has had recent features in Belle The Magazine, Southern California Bride, as well as Carats and Cake. Between planning massive corporate events at The Shrine and House of Blues, the company found time to move into its new office in Long Beach. This was coordinated so Scott could be closer to his newborn son Teo, who he and his wife Kimmie welcomed to the family in April. Finally, Luxury Entertainment Group is proud to announce Scott Cummings as the full owner of the company. Co-Founder Rich Martinez left in January to pursue a career in finance. The team at Luxury Entertainment Group wishes Rich all of the best in his new endeavor! Emilia Jane Photography was named by Brides Magazine both in their July/August issue in print and online as one of the Top Wedding Photographers in the U.S. and Beyond! Blueprint Studios introduces their new app, Vident Exhibits, your full-service tradeshow environments partner. Download the app, create your account, and start shopping! Coastal Catering would like to announce their addition to the Coastal Catering Team! Catering Manager Brandi Cook will be joining with a focus on the Bridal and Social Market. She joins the team with 9+ Years of Wedding Events and Catering Experience, boasting past careers with; Heidi's Events and Catering (out of Arizona), Bon Appetit, and the Fashion Island Hotel (their Sister Company) prior to joining the Coastal Catering Team this past Spring! She is very excited to work with all of our industry friends in this new venture! As the biggest event industry party of the year, Entire Production’s Vernal Equinox at the Bently Reserve was featured in Smart Meetings to showcase a behind-the scenes look at planning this signature event. In showcasing the versatile event space of the Bently Reserve, 7x7 featured a couple that did their nuptials in luxurious and cinematic style for their opulent reception in the historic Banking Hall. PartySlate published its latest PartySlate Select feature, the Top 50 Event Planners in the Country. Our team honored the top producers, event designers, consultants, and creative directors from cities across the country. The article received almost 10,000 page views and organically reached more than 2,000 people on social media. Arizona’s Finest Weddings Sites and Services is proud to announce the launch of their brand new website! Dickie Brennan and Co. announced the on-boarding of Stephanie Aubrey and Kandyce Franklin to their sales team, specializing in wedding and social private events. Stephanie joins Dickie Brennan and Co. with more than 18 years of experience, most of that focused on the wedding market. Kandyce has been with Dickie Brennan and Co. for 10 years and was promoted from key manager at Bourbon House. Both Stephanie and Kandyce complete a sales team that has more than 25 years of combined experience.Stella is almost ready to open its Glamping doors to the public! Bookings can be made starting after Labor Day weekend! Call (504) 919-7474 or email [email protected] for more details! Stella cant wait to share Paloma Lake and the Glamping cabins with you! First Comes Love owner Amy Ulkutekin was selected to co-chair The Special Event s showcase event The Event Experience at Prado Balboa Park on January 9, 2019. The event will highlight the latest trends in the wedding and social event space. Rob Ferre and his team at Life of the Party was selected as Best of State in Utah for DJ Event Services for the third year in a row. Rob Ferre owner of Life of the Party Entertainment in Utah will be presenting for the third consecutive year at Wedding MBA. He will be speaking to the DJ track on becoming a Master of Ceremonies and in a breakout session on becoming a “Virtual Vendor. Avant Garde Titanium asked the wedding divas at HereComesTheGuide.com to share their go-to advice for their piece, “Wedding Budget: 11 Wedding Experts Talk Surprising Costs, Splurging and Budgeting Tips,” they urged the value (even for DIY couples) of investing in reliable professionals, especially for details like photography and flowers. Then, just in time for summer, HCTG’s hot tips for outdoor weddings were featured in Accuweather.com’s recent article; and just to prove that their expertise spans all sorts of events, Team HCTG offered up inspo onRuemag.com for planning the perfect picnic….Picnic weddings, anyone? AFR is opening in the Seattle market helping to service our clients nationwide with 27 locations coast to coast. We are currently hiring in the Seattle market for an Account Executive who will service Seattle and Portland. Please contact Lauren Goldberg at[email protected] for more information. Cindy Celis is one of the speakers at BizBash Live on July 19th. She will be speaking on Tips and Tricks for Avoiding Burn Out: An Interactive Discussion on Mental Health along with Danny Fisk and Lee Dyson. Emily Campbell of Bella Design & Planning was a presenter at the Engage!18 summit in Banff Springs, Alberta, Canada, where she announced the launch of the Engage!Foundation and also spoke about the importance of and best practices for incorporating non-profit work into wedding and event businesses. Bella Design & Planning was also featured twice in the inaugural issue of Couture Colorado. Heather Jones, Catering Sales Director of Wente Vineyards was recently featured on Real Simple where she spoke about things every couple should do before getting married. She was also featured on The EveryGirl for an article on top family fights when planning a wedding. Meghan Ely of OFD Consulting will be speaking at WeddingWire World DC in Washington, DC on July 30. She'll be presenting Dazzle With the Art of Surprise and Delight. Kevin Dennis of WeddingIQ was recently featured on Northwestern Mutual for an article on wedding insurance, including why it's important for couples planning their wedding. 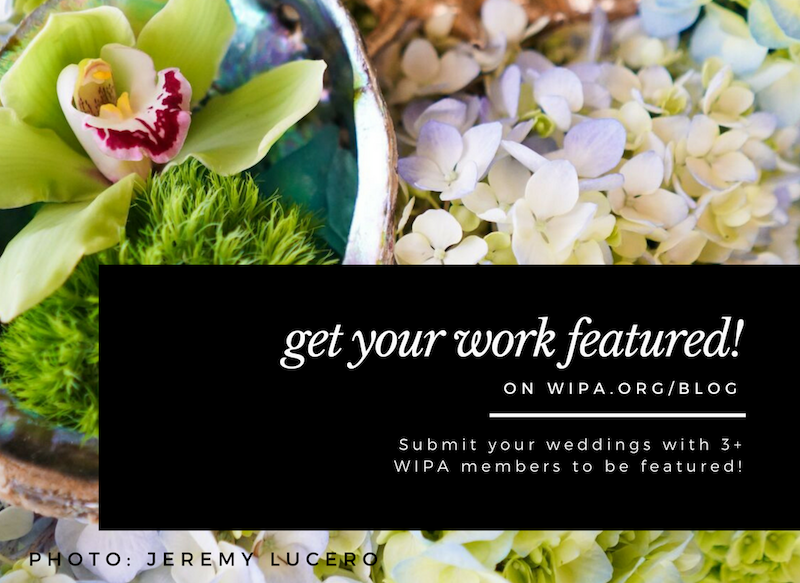 He was also a guest on This Week in Weddings Podcast, Episode 76, where he spoke about productivity apps for wedding businesses. Elwynn + Cass was featured on Style Me Pretty in for coordinating hair and makeup for a Mediterranean inspired wedding at The Fairmont Grand Del Mar. This was also featured on Magnolia Rouge. Katelyn McCullough, founder of Elwynn + Cass, as highlighted on Medium.com in an interview about being a 20 something founder and giving her 5 lessons she’s learned. Bespoke Edge was awarded the Readers’ Choice Best Local Men’s Boutique by 5280 Magazine. Luxe Linen was featured on Belle the Magazine for An Elegant Tent Wedding with a Rustic and Ethereal Twist. Luxe Linen is also highlighted on Mandala Weddings for this beautiful Pelican Hill Indian Wedding and for this Pelican Hill Sikh Wedding. Luxe Linen is also featured on Every Last Detail for a Blush and Burgundy San Clemente Wedding. Premiere Party Rents is featured on Martha Stewart Weddings for this purple Malibu wedding. Premiere Party Rents is also featured in Ceremony Magazine as well as The Knot. Good Gracious! Events was a sponsor for BizBash Live LA at the California Market Center! Good Gracious! Events is also featured on Catersource and Special Events for XO Bloom's "Blooming Into Summer" dinner. Registration is now open for J. La Plante Photo's Iconoclasm Workshop! When J. La Plante Photo first started shooting weddings, we conformed to what we thought wedding photography was “supposed” to be. We shot to get published. We shot to appease family members. And in doing so, we burned ourselves out. Nowadays, we attract like-minded couples who hunger for something different from the status quo. Instead of feeling worn out and jaded after a long wedding day, we feel energized because what we want and what our couples want are the same thing. If this story resonates with you in any way, or if you’re just looking to take your photography to the next level, then our Iconoclasm Workshop might be up your alley. Join us for two full days of insight, image deconstruction, and hands-on activities in a safe place to learn and grow, free from judgment or criticism. The Iconoclasm Workshop will take place November 7-8 at Red Rocks Park in Morrison, Colorado. We hope to see you there! In celebration of their five-year anniversary serving the Southern California market, Blueprint Studios is pleased to announce the opening of their newly built showroom and design center. Offering a comprehensive look into Blueprint Studios' vast, locally-stocked inventory, the showroom truly represents their "Studios of Studios" approach to event design. Their nearly 90,000 square foot facility offers today's most innovative event design resources. Find out more on why Blueprint Studios is so much more than just a rental company. 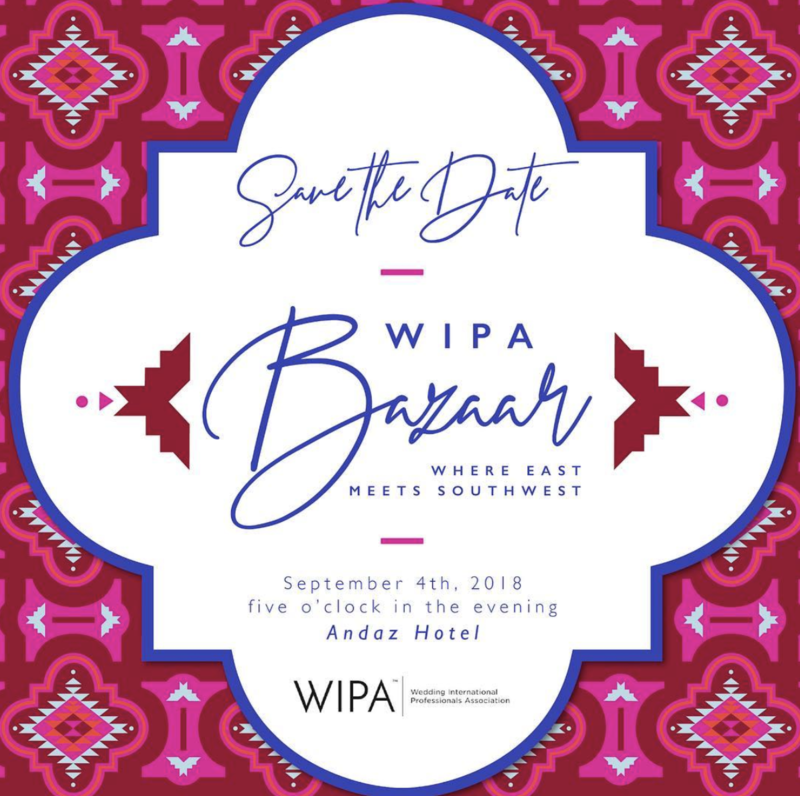 WIPA members who fulfill tour appointments will join an exclusive list of clients who are entitled to promotional pricing incentives for the remainder of 2018. Contact their creative account team to schedule a few hours of inspiration, creativity and hospitality. STAY TUNED FOR DETAILS ON OUR MEMBERS ONLY EVENT IN AUGUST! We are so excited to announce our upcoming members-only event! Save the date, more info coming soon!